The Great Southern Stamp Sale: Dud stamps, oh my! In every collection of rubber stamps, there are sure to be a few duds. Ones where the rubber hasn't been looked after, or that got handled a bit roughly. And this collection is no different. 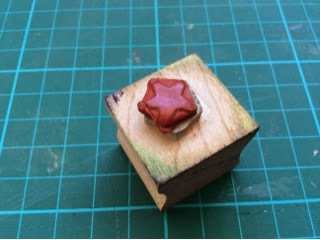 Ellen mostly kept her stamps in good condition (stained from regular use of course) but I found this ONE minuscule star stamp, which has badly damaged rubber. But I thought I'd show it to you, so let you know I am being vigilant for things I shouldn't be passing on. But ... Can I throw it away? I do have a few tiny unmounted stamps... Maybe one of them can hitch a ride on this good mount. By the way, they say baby oil is very BAD for rubber stamps (some people use it to clean then, and I don't believe that's a good idea). Sunlight definitely is bad for rubber. A good commercial stamp cleaner is a good investment. I use the Stampin' Up one, and it works a treat. And if that's not available, I use an old face washer and water.